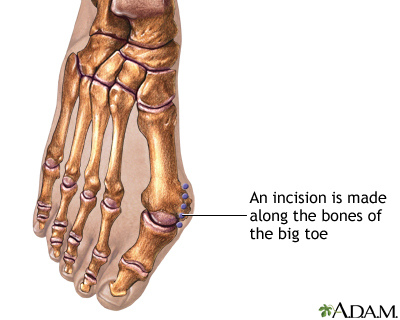 Bunion removal is surgery to treat deformed bones of the big toe and foot. 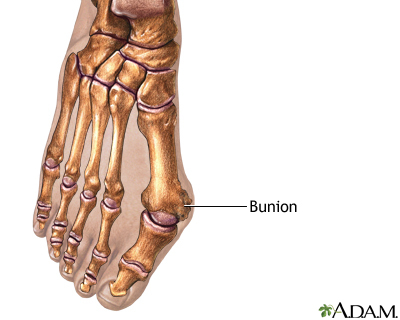 A bunion occurs when the big toe points toward the second toe, forming a bump on the inner side of the foot. A bunion forms when your big toe points toward the second toe. This causes a bump to appear on the inside edge of your toe. You will be given anesthesia (numbing medicine) so that you won't feel pain. Local anesthesia -- Your foot may be numbed with pain medicine. You may also be given medicines that relax you. You will stay awake. Spinal anesthesia -- This is also called regional anesthesia. The pain medicine is injected into a space in your spine. You will be awake but will not be able to feel anything below your waist. General anesthesia -- You will be asleep and pain-free. The surgeon makes a cut around the toe joint and bones. 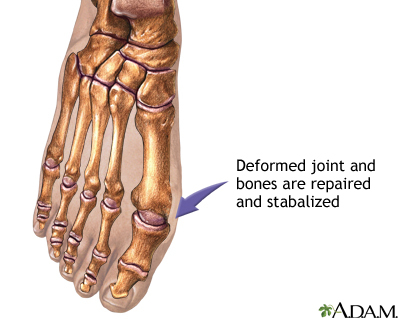 The deformed joint and bones are repaired using pins, screws, plates, or a cast to keep the bones in place. Making certain tendons or ligaments shorter or longer. Taking out the damaged part of the joints and then using screws, wires, or a plate to hold the joint together so that they can fuse. Shaving off the bump on the toe joint. Removing the damaged part of the joint. Cutting parts of the bones on each side of the toe joint, and then putting them in their proper position. Your doctor may recommend this surgery if you have a bunion that has not gotten better with other treatments, such as shoes with a wider toe box. 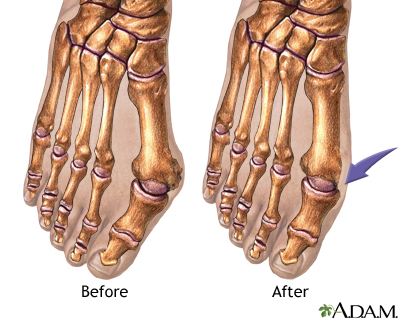 Bunion surgery corrects the deformity and relieves pain caused by the bump. Tell your health care provider what medicines you are taking, including drugs, supplements, or herbs you bought without a prescription. You may be asked to stop taking drugs that make it harder for your blood to clot. These include aspirin, ibuprofen, (Advil, Motrin), and naproxen (Naprosyn, Aleve). If you have diabetes, heart disease, or other medical conditions, your surgeon will ask you to see your provider who treats you for these conditions. Tell your provider if you have been drinking more than 1 or 2 servings of alcohol each day. If you smoke, try to stop. Ask your provider for help. Smoking can slow down wound and bone healing. Tell your provider if you get sick with a cold, flu, herpes infection, or other illness before your surgery. Follow instructions for not eating and drinking before the procedure. Take your drugs your provider told you to take with a small sip of water. Most people go home the same day they have bunion removal surgery. Your provider will tell you how to take care of yourself after surgery. You should have less pain after your bunion is removed and your foot has healed. You should also be able to walk and wear shoes more easily. This surgery does repair some of the deformity of your foot, but it will not give you a perfect-looking foot. Full recovery may take 3 to 5 months. Coughlin MJ, Anderson RB. 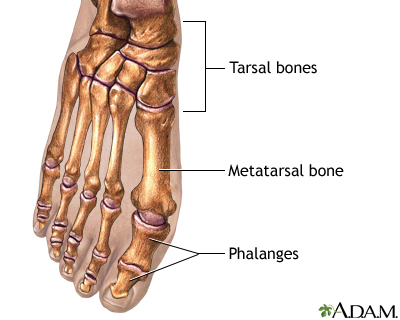 Hallux valgus. In: Coughlin MJ, Saltzman CL, Anderson RB, eds. Mann's Surgery of the Foot and Ankle. 9th ed. Philadelphia, PA: Elsevier Mosby; 2014:chap 6. Murphy GA. Disorders of the hallux. In: Azar FM, Beaty JH, Canale ST, eds. Campbell's Operative Orthopaedics. 13th ed. Philadelphia, PA: Elsevier; 2017:chap 81.